Richard, So many names are coming into this string that I am getting a little confused. Are you saying that the Milton researchers are thinking that Mary McLachlan Blaikley, QMAAC. is the Canadian link and that she also went under the name of Paterson? Now that you have put forward the suggestion that she may have been nursing I can put forward another candidate. The York Minster panels have a section called "Auxiliary Hospitals". The listing of women under this heading is short of detail and a devil to research. I had always thought that these women were unskilled nurses doing the very basic work in hospitals or perhaps on the clerical side. But there is a name there in D.M. Paterson. Could this be the Mary Paterson mentioned with her going by her second name? Thanks Jim, I had missed this post. The Mary Paterson I was hunting for was to have been one of the workers killed in the May 30, 1918 bombing. In my mind now I have very little doubt that the person they think was Mary Paterson was in fact Mary Blaikley. Back in 1918 I think the papers just assumed she was the daughter of Private Paterson from Milton, Ontario but in fact she is never referred to by the name "Paterson". It is always "daughter" or "Mary". I do think that Private Paterson's wife was in Elizabeth Blaikley, the mother of the illegitimate daughter Mary Blaikley. Whether Private John Paterson was the father or not has not yet been determined. He may have met and/or married Elizabeth after the conception of Mary. Actually I have yet to find a resource to tell me if John Paterson's wife was named Elizabeth but I should be able to find that information in Ancestry.com or a similar site. Have to find a friend who is a paying member to do me a Look-UP? I have completed my report on the matter of Nurse Worker Mary Paterson. I am more or less convinced that the person was in fact Mary Blaikley and that Mary Paterson never existed and certainly was never in Canada. As such, she should not be on a Great War Memorial or Cenotaph in Canada. I prepared this report so that I can submit it to our local Legion Branch, as they decide what changes (if any) are made to the cenotaph. I would appreciate any reviews of this document, as I would rather face it here on the GWF and/or the CEFSG rather than later at the Legion! Thanks to all CEFSG and GWF members who have assisted me in this hunt for factual evidence. I, too, have come to the conclusion that Mary Paterson has been assumed to be the daughter of Private Paterson when in fact she was the illigitimate daughter of his wife. There is no evidence seen that she was adopted or that she assumed her step-fathers name. At a stretch she could go on the Milton Cenotaph as Mary Blaikley but her connection with Canada is so tenuous, and she almost certainly never set foot in the country, that she would better to be omitted. She is, afterall, remembered on Gartcosh War Memorial (her home town). She is, afterall, remembered on Gartcosh War Memorial (her home town). Thank you for that confirmation Jim, as I have been asked here by the Canadian memorial people if Mary Blaikley is commemorated on any other memorial. Does anyone know if there is a photograph of the memorial showing her name, or if not some formal document that I could use in my report? Just my luck that it appears Gartcosh is just on the fringe of the high resolution Google Earth - if this is the correct place? Photos of the Gartcosh Memorial available on the Scottish War Memorials Project. Mary Blaikley is listed on it. Photos on the Project are free to use, only stipulation is an acknowledgement of the source. I'm Margaret's great niece and see you have been researching her story in the past. Are you related? Family history has always told her story and how her mother reacted to the terrible news. I would dearly love to have copies of the images you mention here. Margaret was my Great Aunt. Her mother my Great Grand Mother. Mary McLachlan Blaikley, QMAAC. She was the grand-daughter of James Blaikley of Glasgow. Cannot see a Canadian connection. Margaret Selina Caswell, QMAAC. Daughter of Frederick Caswell of Chandler's Ford. Cannot see a Canadian connection. Ethel Frances Mary Parker, QMAAC. Daughter of William Carter of Canterbury. Cannot see a Canadian connection. That is the only Mary's from this bombing. 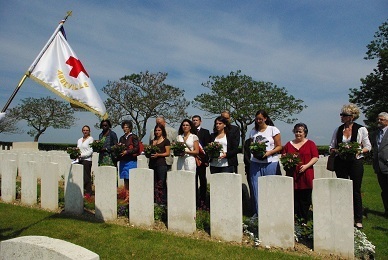 However around the same time there was a bombing on 3 Canadian Stationary Hospital, Doullens where three Canadian nursing sisters (Baldwin, MacPherson and Pringle) and two doctors were killed. Dorothy Mary Baldwin Baldwin, CAMC. Daughter of W.Y. Baldwin of Ontario, Canada. I had already thought that Paterson could have been a married name but discounted it as most unlikely. I also haven't quite got my head around why a woman with a Canadian background should be in the QMAAC. The members of the QMAAC were engaged mostly in domestic work and came from the working classes. She could have come over from Canada to help in the war effort but to do so she must have had money available to have made the trip. So family money in Canada would more likely to have seen her join the VAD which drew many of their members from the middle classes. But this is all supposition and we really need to get back to how the Milton Cenotaph people were persuaded to add her name. 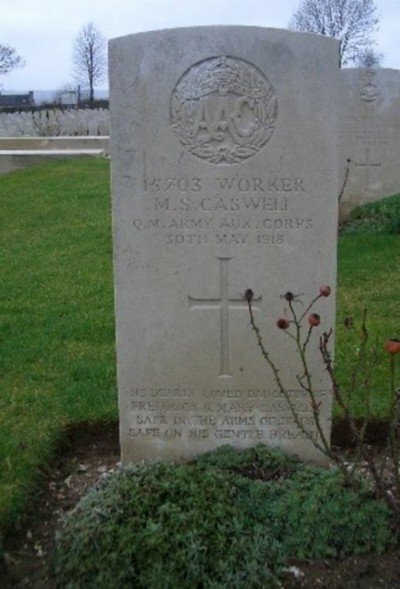 Oh yes, Margaret Caswell came from good working class stock and was part of a large hardworking family. Strangely, her younger sister was in no doubts at all that Margaret was a nurse in the Q.M.A.A.C. Her younger brother Charlie was a farm labourer in Churt - possibly on Lloyd George's Estate - and married a local girl Mabel who was in service on the Estate around 1922-24. I'm intrigued as to why there's so much interest in Margaret and the others who sadly lost their lives in this was. Was it unusual or were the first women to die at the hands of the enemy or in the front line? We hold her casualty plaque, victory medal, prnted scroll, portrait photo and modern photo of her grave as part of the former WRAC Museum collection; she also featured in our "finding the Fallen" exhibition a couple of years ago. That is at the National Army Museum Chelsea! This discovery is really starting to become emotional for me. As you seem to hold a great deal of my Great Aunt's records are you able to confirm whether she was in fact a waitress or a nurse? Her sister was always perfectly sure she was nursing out there and it was she who had the medal until a few years back, until giving it to a museum, although she didn't mention which one. I'm so happy to know now and will visit the NAM sometime soon. My sister and I have always found Margaret's story fascinating but had no idea other people did too. My name is Irene Caswell and Margaret Selina was my Great Aunt. I have other images but would dearly love to see a photograph of Green Cross Farm. Margaret was from a large family and her two brothers also served in WWI and both survived. Their mother, my great grandmother - was naturally distraught at the news of the demise of her first born. Many thanks and hope that you're still active on this web site. 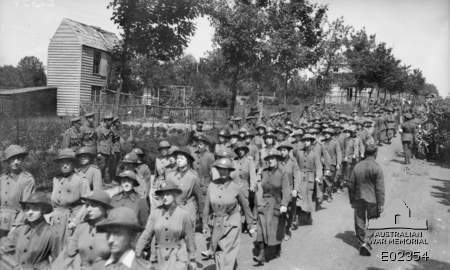 Does anyone know if any Australian women served with the Queen Mary's Army Auxiliary Corps? Out of curiosity how many women served in the QMAAC? Hi, i don't have this reference. I have : 1919/03/13, MOORE Beatrice, 21 years old from London, Number 2199. Le 14 février 1919, WALCROFT Kitty, née le 13/11/1894 à Maidenhead, est décédée à l'hôpital d'Abbeville 80100 Somme France. Elle faisait partie du QMAAC. Le 16/11/1918, O'NEIL Teresa, de Ballyrussel, Cloyne, Foreworker du QMAAC, est décédée à Abbeville, 80100, Somme, France. La sépulture de WALCROFT Kitty est référencée V F 36 dans le cimetière du Commonwealth d'Abbeville. I had a look at the Coming Home exhibition in Inverness yesterday, before it moves off in its travels around the Highlands. I had not realised that one of the Scottish Women's Hospitals was from Fort WIlliam (Edith Mabel MacKenzie), I mentioned this a couple of people who also did not know but told me of another member (Evelina Haverfield) and also Lila Davy of the QMAAC. Lila Davy's "extensive diaries" were apparently serialised in the local Braes magazine some years ago. Marsouin 80 (Le Souvenir Français, Abbeville Somme).